Key to Percents Reproducible Tests contains all the testing material you will need while using the Key To Percents series. Also included are several useful organizational aids. 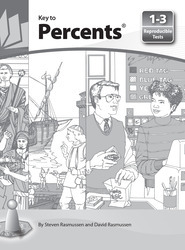 Key To Percents Reproducible Tests contains Final Tests for Books 1-3, Diagnostic Tests for Books 1-3, a Class Progress Chart, a Stop and Check Wall Chart, and Answer Keys for Final and Diagnostic Tests.